CJ Shearn is a freelance writer and a devoted Shinnyo-en member of the Shinnyo-en New York Temple. He was one of 10 Shinnyo-en Youth Association (YA) members who attended the first of the Infinite Paths to Peace (IPTP) Leadership Retreats in NY. At the Retreat, he participated actively and also assumed the Home Group facilitator’s role with three other YA members. 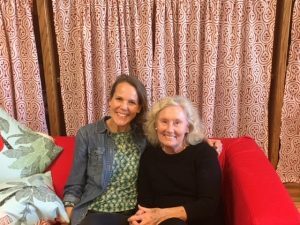 A Home Group was a small group of intergenerational participants whose age, gender, religious and geographical representation or background varied. One of CJ’s many contributions to the Retreat was that he always stepped up to assume a leadership role as he volunteered to co-facilitate the Open Mic at Saturday night. In addition, he shared openly and honestly that the challenges that he experienced to get to Edith Macy Conference Center by arranging a couple of different transportation providers. 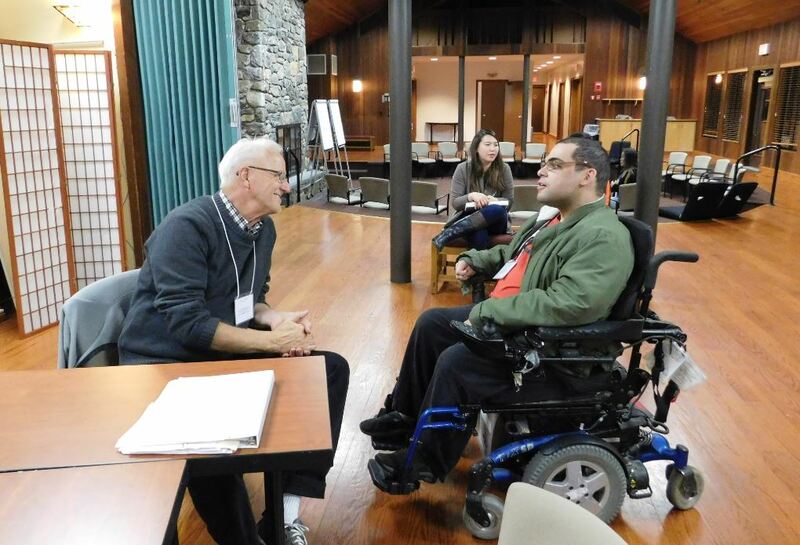 He helped all of the Retreat participants gain a keen awareness of the physical challenges that many of us take for granted. Below please enjoy CJ’s reflective writing on our first IPTP Leadership Retreat. 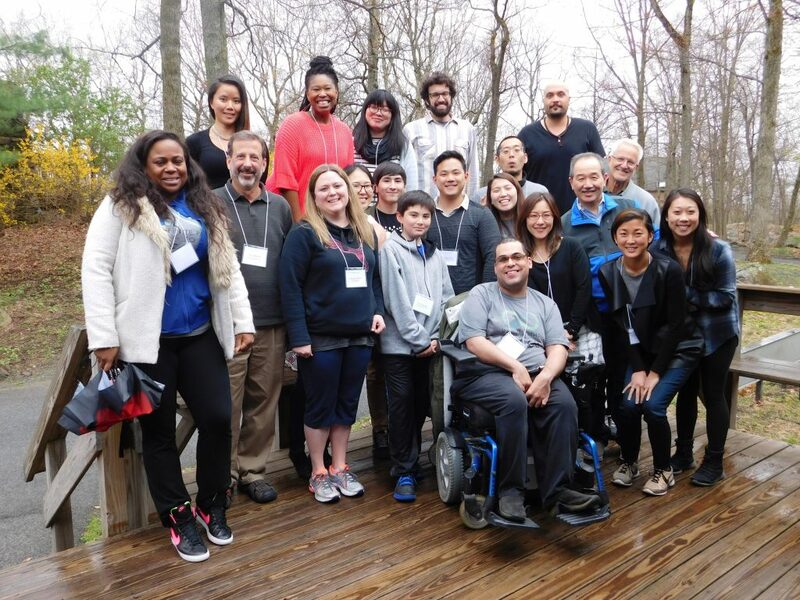 On April 21-23, 2017, Shinnyo-en Foundation hosted the first ever Infinite Paths to Peace Leadership Retreat at Edith Macy Conference Center in Briarcliff Manor, New York. Given that it was the first of the series of the Retreats, the program was a pilot of sorts to see if it would go over well with other Shinnyo-en districts, and by the end of the weekend, the response from the participants was overwhelmingly positive. 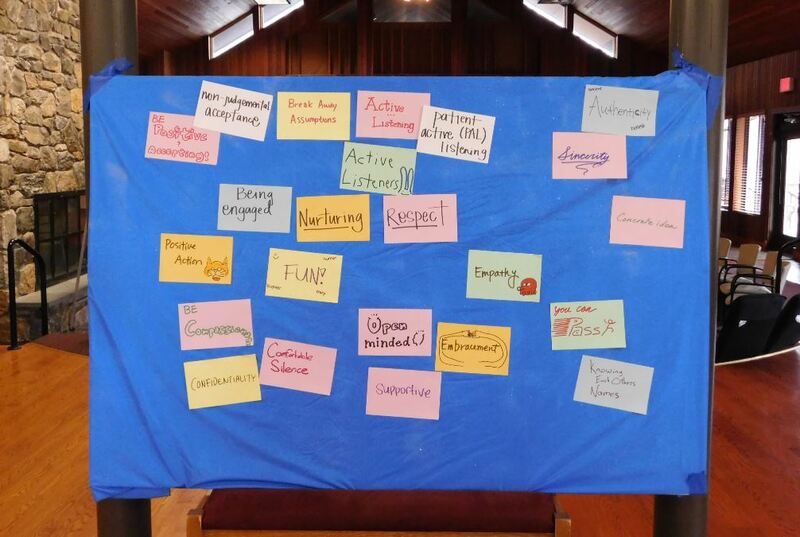 The goal was quite simply to teach leadership to Shinnyo-en young adults, not only individually, but collectively through skills such as active listening, establishing an agreed set of norms and funneling all input into a cohesive whole. The retreat was brilliantly orchestrated by Shinnyo-en Foundation program director Ineko Tsuchida, whose goal is to help empower Shinnyo-en young adults to be leaders within themselves and in their broader communities, and also truly harbor the diversity in the society that we all live in, engendering the core value of embracement. The way in which true diversity was achieved over this Retreat was by including Shinnyo-en members such as the Foundation’s vice president, Reverend Jay Gibson, who also serves as Temple Manager of the LA temple, Reverend Eitaro Hayashi, in charge of the Shinnyo-en’s New York temple, and non Shinnyo-en members of other faiths and backgrounds such as Senior Shinnyo Fellow Leif Erickson and Melissa Geddis of Youth Community Service (YCS), Jenna Sethi and Lacey Allen of Search Institute, who have worked with Shinnyo-en Foundation intimately to create this Retreat. Mr. Erickson in particular was a shining light the whole weekend with his truly open and understanding nature, which helps to inspire youth in the San Francisco Bay Area to find their purpose. 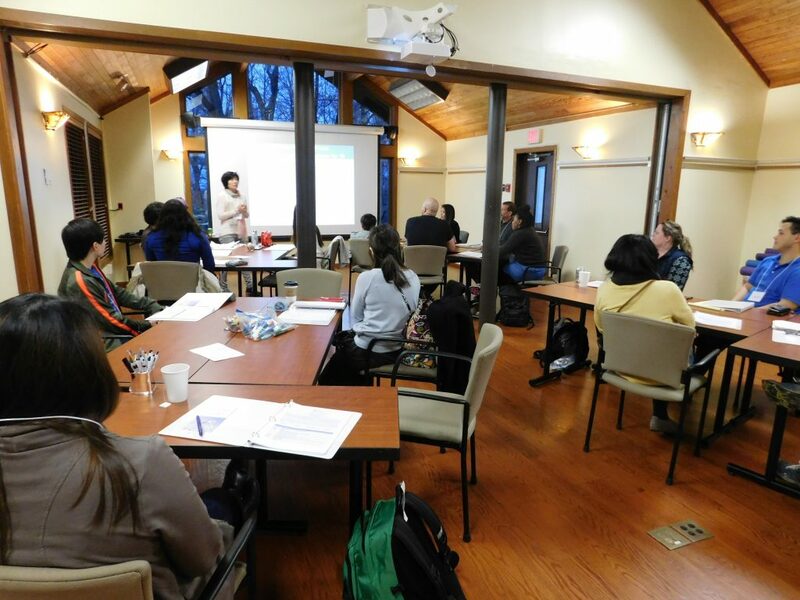 The directionally challenging long winding roads in the picturesque setting of Briarcliff Manor could not stop participants from converging at the meeting hall of Edith Macy, a gorgeous 400 acre property abound in the natural world. A relaxed dinner featuring an absolutely incredible crème brulee cheesecake as dessert kicked off the weekend in grand style. Most of the Shinnyo-en Youth and Jr. Youth Association participants came from the New York region, while a few came from Chicago, and the Massachusetts districts. The activities started with Human Bingo where everyone circled around the room to find out facts about each other that maybe they didn’t know– a simultaneously fun and awkward activity to be sure! Three activities during the weekend deserve special mention. Consistent efforts were always being made to apply the teaching of Shinnyo-en, not just traditionally but in modern means. There are few better ways to demonstrate how to become a leader than using late hip hop legend Tupac Shakur’s poem “The Rose That Grew From Concrete.” Lead by activity leader Melissa, each participant was directed to draw a picture. Concrete represented our struggles, and something beautiful can grow from trials we face. The stem of the rose symbolized foundation, while the thorns represented hindrances that hold one back, and the leaves passions, keeping us afloat. In many ways Shakur’s prose is directly related to the classic Buddhist metaphor of the lotus flower. Lotus flowers grow from mud but eventually blossom into something breath taking, and this particular part of the workshop taught participants about their own inner beauty that can serve society. Each person then displayed their picture art gallery style, and was encouraged to interpret the meanings of each piece. 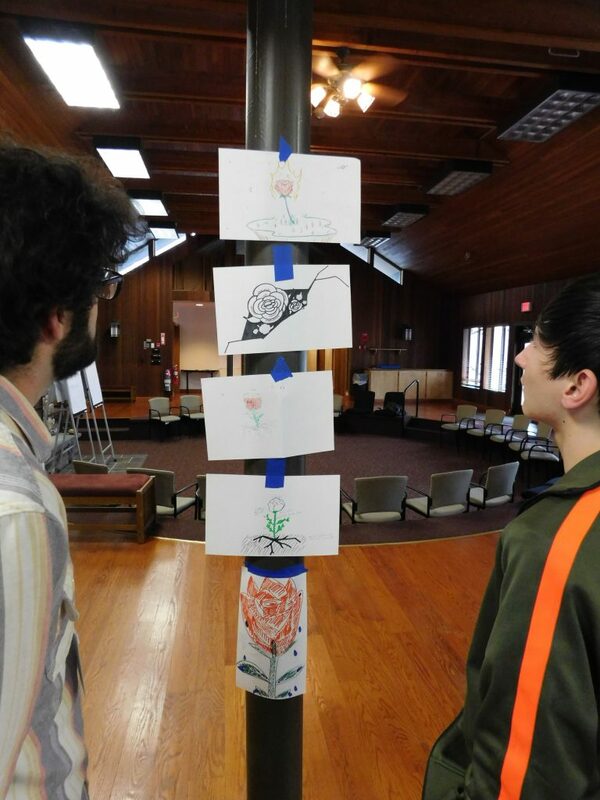 Afterwards, each YA member explained what their illustration represented and what each aspect meant to them. 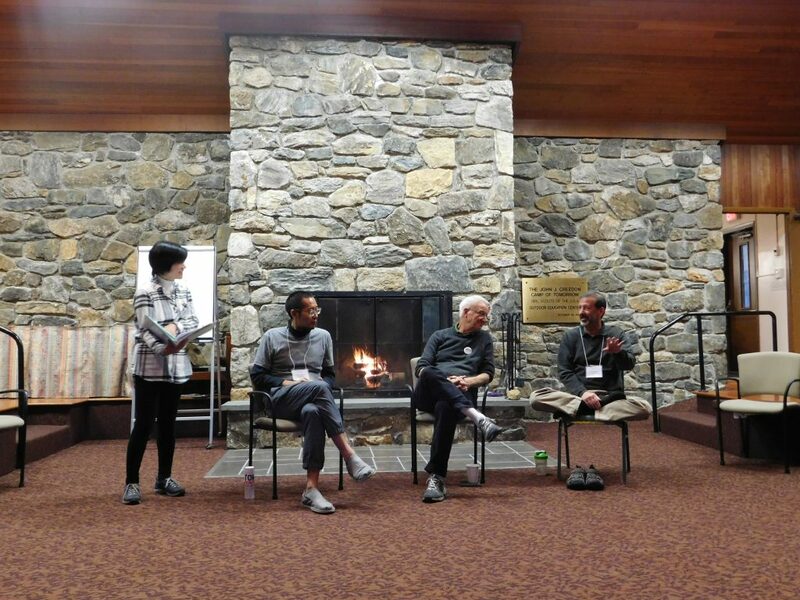 Saturday evening’s fireside chat with Mr. Erickson, Reverend Gibson and Reverend Hayashi provided an opportunity to learn more about their diverse backgrounds and the spirit of embracement. Reverend Hayashi’s journey to faith as Temple Manager of the Shinnyo-en NY temple was intriguing and unexpected. After finishing school in Hawaii, he moved to San Francisco in hopes of becoming a musician and using those aspirations for peace and joy for others, but it was a series of different seasonal jobs and the encouragement of a practitioner that started him on the path of true selflessness. Both Reverend Gibson and Mr. Erickson come from Christian faith traditions, and rather unlikely career paths, Mr. Erickson from advertising and Reverend Gibson a theater lighting technician. Reverend Gibson was intrigued by Shinnyo-en after his wife left periodicals on their night stand, and while Mr. Erickson is a senior Presbyterian Christian, his devotion to the youth community and his church broadly demonstrate, loving-kindness, compassion, and a true drive to make the world better. Shinnyo-en thrives on diversity, and is all inclusive, and each speaker’s inspirational story showed how humanity is interconnected. Regardless of differences, everyone wants the same thing. Reverend Gibson’s morning meditation following group chanting on Sunday found everyone walking about the property for a half hour pondering Shinnyo-en teachings, really setting the tone on the last day, on what each person could do using their individuality to be a leader in society. Perhaps the divergent paths each person took along Edith Macy’s many trails symbolized the infinite pathways there are to peace. The final activity of the retreat was what the Infinite Paths to Peace program is all about. Each YA member made a keychain from a selection of beads of their choosing, with their own unique meaning ascribed to each color and type. Junior YA member Sean Robinson of Massachusetts, one of the weekend’s most astute contributors, chose a striking small silver bead as the centerpiece of his chain and noted that no matter how small a person thinks their contribution may be, they are a part of something. Ms. Tsuchida wanted this to be a wonderful memento of the two and a half days, and her role as a general facilitator for the whole weekend was incredible. Her appreciation of each home group leader and her gentle guidance to each on their leadership style was heartfelt, and a tool to help each one become a leader in society. The post retreat feedback session from YA members was instructive, and it seems as though this is just part one of Shinnyo-en’s IPTP initiative. The retreat will be run in other districts, and further sessions will include how to be a leader in the community. The lessons learned and the fellowship with one another long reverberate after the retreat’s end, with the proper mindset and true caring about others. Peace is indeed possible. For more photos from this retreat, please follow this link.